November 30, 2018: Morningstar has been announced as a finalist for the the Madison Area Music Association’s Breakthrough Artist of the Year Competition. The Breakthrough artist competition provides up-and-coming area bands an opportunity to increase exposure and grow as artists. Other finalists include, The North Code, Lodi-based blues-rock artist, Mickey Magnum, jazz artist Hypheria, funk brass-band Wurk, Mars Hall Band, Liv Rather and Bone Holler. 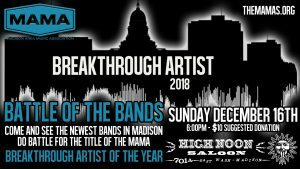 The MAMA’s Breakthrough Artist of the Year competition will be held on Sunday December 16, 2018 starting at 7p at the High Noon Saloon in Madison. Door fees go to raise money for the MAMAs and their charitable work. Tickets can be purchased here.